Ginger is one of the most common ingredients in cooking all around the world. It spices up all kinds of foods and drinks, both savory and sweet. It has been used for centuries in many cultures as a spice, snack or for medicinal purposes. 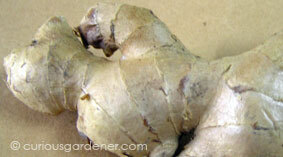 Technically, ginger is a rhizome, not a root. The part of the plant that we eat is formed underground, with roots growing out of it, and shoots that grow above ground. It’s just a common assumption that since it grows in the ground, it’s a root. Not. Here in Singapore, ginger is used often in cooking, so I figured I’d give growing it a go. My first attempt at growing ginger was in idle fun. We had a piece of ginger that had been kept too long and had started sprouting. I placed it on the surface of an unoccupied flowerpot to see how it would grow. When the sprout turned green and the first leaf began to form, I thought it would be better to plant it in the ground. Unfortunately, the roots broke off from the top of the plant when I was attempting to transfer it. This just made me want to try again, so I bought a packet of old ginger from the supermarket and kept the rhizomes until growing buds began to appear. 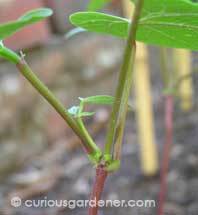 To maximise the number of plants I could grow, I cut each rhizome so that there was one good growing bud per piece. 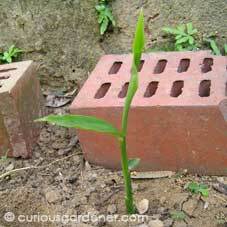 You can have more than one bud per piece of ginger planted, but I thought I’d go with just one. That could be a risk, but I didn’t think it would be, really. After cutting the ginger into smaller pieces for planting, I kept the pieces in a dry, dark place for a couple of days until the exposed surfaces of the ginger had dried. That also gave the buds more time to grow. 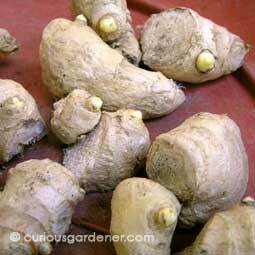 When the rhizomes had dried suitably, I followed instructions from several sources and planted each piece of ginger between 8-10cm deep, growth bud facing up, with a space of 15-20cm between each plant. It took 2-3 weeks for the first plant to make an appearance. Since I had so many candidates for planting, I decided to experiment with different locations. The first lot was planted directly in the ground under the shade of a mango tree – about 1.5m away from the tree trunk. They get some sunlight from morning through noon. I had a 50% success rate with the sprouts (so far). The next lot (I waited for suitably sized growing buds first) was sowed a week or two later in a sunny location. I had read that ginger does not like full sun, but since we live in the equatorial region, I thought I’d see how they do in our climate. To my utter surprise, I had a 100% success rate with the sprouts. I also have one plant growing in a pot, as a test for friends who live in apartments and who complain that they can’t grow such veggies. That was one of the first rhizomes to sprout. My final lot was planted in the shadiest location of all under the mango tree. That spot gets late afternoon sunlight. It’s too soon for sprouts to appear yet, but I’m keeping an eye on the place. 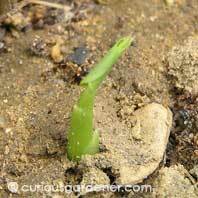 Tropical Permaculture: How to grow ginger? © 2010 curiousgardener.com All rights reserved. 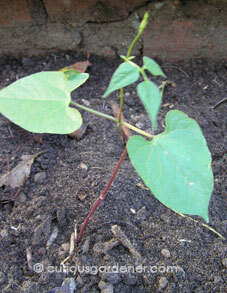 When it came to the decision of what veggie to start planting, my first thought was beans. We had experimented with them as children and it was a nice thought to go back to carefree days through this activity. So on my next visit to a nursery, I checked out what seeds they had and ended up with snap beans. According to the description on the packaging, these are especially suited to hot weather and humid conditions. Just perfect for Singapore, right? The seeds were dark purple, just over about 1cm in length. There were 13 of them in the foil packet, and I wondered if all of them would grow to maturity and supply us with lots of beans. I sowed the seeds in a planter to give them a chance to germinate undisturbed. Snails can do a lot of damage, given the chance — and I wanted to make sure I eventually have something to harvest. Lo and behold, 5 days after sowing the seeds — and exactly as they said on the packaging — the first seed broke through the earth, like some sort of creature pushing its way out of the dark and into the light. It really did seem like they were outworldly creatures as bumps began to appear on the previously-flat surface of the earth in the planter. Each time I went to peek, there would be another bump appearing, and once it broke through the earth, you could see the unwieldy head of the bean pushing its way up, curled under the stem. Once the whole bean was out, it would shed the seed casing and start tilting it’s head upwards. Then the seed leaves would start to emerge. Boy, I think Mrs Thomas, my old Bio teacher will be impressed I remembered that much! Out of the 13 seeds that were planted, only one didn’t make it. After a couple of days, I transferred the seedlings to a bed I had prepared. To make sure they liked it there, I had loosened the earth and mixed in some compost a few days before. I wasn’t sure if these bean plants would be climbers or bushes. It wasn’t indicated on the packaging and research on the Net said string beans could be either one. And so I waited and watched. After a couple of days, it became apparent that they were climbers, so I had to make a short trellis for them to call home. The 4-foot bamboo sticks were bought from a nursery. I decided to use a “tepee” design, with the base of the sticks stuck in the ground and meeting at the top. I used bag ties to secure the tops and the horizontal sticks. It has been pretty entertaining watching where the tendrils would creep to. The top 4-5 inches of the stem are green, and have a sticky, prickly texture to them. As the stem grows longer, it changes colour to red/green, and that feels nice and smooth, like a regular stem should. At first, I helped direct the plants to the poles so they could start growing upwards. Those that did wound themselves around the supports in an intriguing, windy manner. A couple of the plants had the misfortune to be trampled over by our dogs. I love to watch how plants keep growing... Even new leaves thrill me! Take note not to plant things in areas where your pets are used to running freely. When you do that, you have to be prepared for casualties. In my case, I had to put up big, visible barriers and give a lot of verbal warnings. After about a week, the dogs got the idea. However, they still can’t seem to resist strolling over the soft, compost bed every so often. Thankfully the plants are matured now, and the tepee’d trellis protects the roots. But, I lost 2 plants to the rampaging dogs, before the trellis was constructed. A third plant managed to survive because it had been beheaded quite high up and managed to re-sprout leaves. The plants are now about a month old. If the packaging is accurate, I have another 6 weeks to wait until they reach maturity. I’ll keep you posted. I initially got interested in gardening because of my fascination with propagating plants. My sister got the ball rolling when she started passing me cuttings from her garden that she didn’t want to just throw after pruning. Just poke the stems in a pot of earth, she said. They’ll grow from there, she said. Obviously, it didn’t always work, but I became determined to increase my success rate. That opened my eyes to looking out for pretty plants, and I began exchanging seeds and cuttings with friends and family, and collecting them from wherever else I could. My pride and joy are my Peacock trees – orange and pink varieties – that I grew from seeds. The flowers add gorgeous splashes of colour to the garden and the trees attract all kinds of birds and creatures. 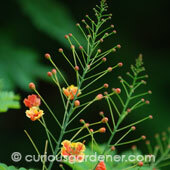 Up to now, I’ve only been interested in ornamental plants, because I viewed fruiting trees as being higher maintenance. Insects, snails and aphids are attracted more to them, and my dad had a constant battle spraying insecticides and fertilizing the plants. It seemed like a lot of trouble to me, without a guaranteed good harvest. Then, something began to change in the last couple of years. I began to pay more attention to cooking shows on TV and it looked really cool when the chefs would walk over to potted plants and snip off a bit of fresh herb for whatever they were cooking. For the fun of it, I bought a pot of rosemary and another of mint. The rosemary didn’t survive, but the mint hiccuped and came back from the brink of death. I began to take the herbs more seriously and began reading up on how to help them survive in our tropical weather. At the same time, a couple of other things clicked into place in my head. I grew up hearing of the struggle that many had during the Japanese Occupation, with not enough to eat. They had to grow things like tapioca to supplement their food rations. A friend Down Under also complained recently about the rising cost of ginger, and I joked that she should plant some herself. She claimed that she doesn’t have green fingers, but an online search indicated that it’s fairly easy to grow ginger. I found a bit of old ginger in the kitchen that had begun to sprout, stuck it in a pot and it began to grow. Alas, I hadn’t planted it deep enough, and it didn’t survive when I tried to transplant it to the ground. That was it. I had to experiment a bit more and succeed at it. And so the Curious Gardener came about. I want to try to grow as many kinds of vegetables as I can in sunny Singapore, but there’s obviously much more to it than opening a packet of store-bought seeds and following instructions. This site could just be about trials and tribulations of planting, but I’m hoping there will be successes to share as well. Hopefully, the journey will be a good one!